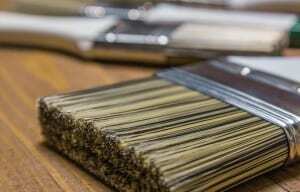 Home/News, Paint, Paint Brushes, Products/Which type of paint brush should I use? With all of the different kinds of paint available, there are brushes that are more suitable for one type of paint over another. On the marketplace, there are a variety of paintbrushes in different sizes, shapes, prices, materials, lengths, and bristle types. One could say that choosing the appropriate paintbrush is often as difficult as selecting the most desirable paint type and color. The brush selection process is centered around the surface, room, or project you’re working on as well. Luckily, there are only a few brushes that you really need in your toolbox to handle most of the DIY chores you might have around your house. These are the four things you should take into consideration any time you’re looking for the apropos paintbrush for the job: Bristle Type; Brush Width; Bristle Shape; and Bristle Tips. There are two types of bristles, also known as filaments: natural and synthetic. Natural bristles are made from animal hair and are best suited for oil-based alkyd paints. On the other hand, synthetic bristles are fabricated from nylon, polyester, or a combination of both. Although some synthetic brushes can be used with alkyd paints, they are more notably suited for use with water-based laytex paints. It’s best to err on the side of caution and read the label on the brush to learn more about its best application. A good rule of thumb is to match the brush width to the surface to be painted. However, for best results, it’s wise to use a brush size just under the width of the surface. The square-cut brush dominates the marketplace. There’s also the sash brush, which is cut on a small angle, that gets into tight places. You’ll find flagged, or split, ends on the superior quality of brushes. The flagged bristles hold more paint and readily spreads the coat of paint more smoothly, creating better coverage. Tipped bristles come to a point, as opposed to being cut flat and straight like a square-cut brush. Tipped brushes provide more precision and tighter control. If you still feel overwhelmed by selecting the proper paintbrushes, the experts at Texas Paint can help you find precisely what you need. Texas Paint, locally owned and operated, has been in business since 1947. We have 4 locations across the DFW area to serve you.